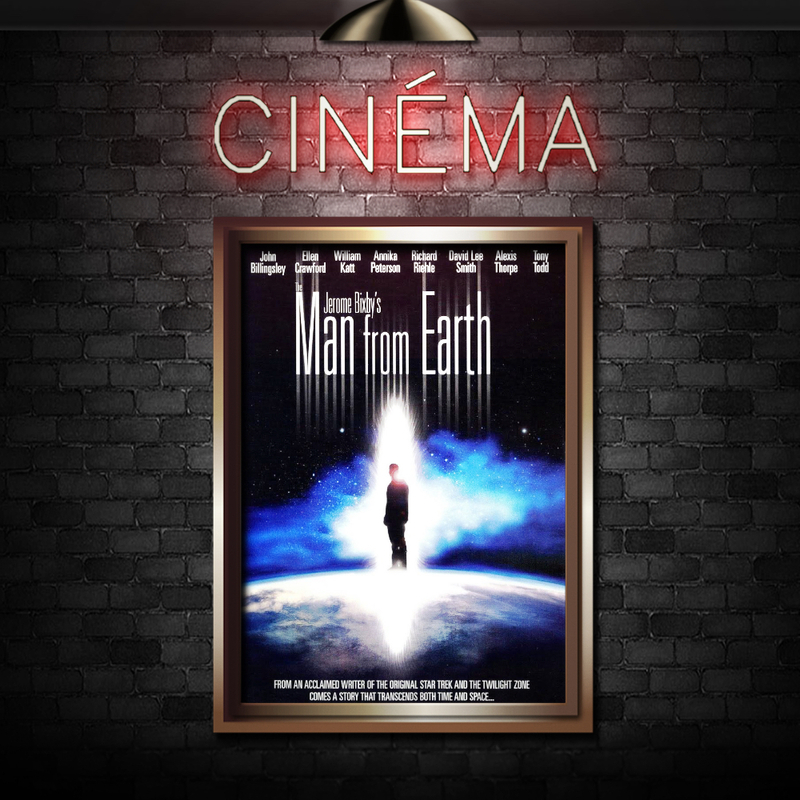 The Man from Earth, a drama science fiction film released in 2007, captures the concept of identity formation – an idea that has long plagued philosophers and critical thinkers. In the 20th century, thinkers produced extensive work on the politics and ethics of self-fashioning [footnote 1]. After the cultural crisis that the world found itself in post-Wars and ideological revolutions where writers such as Nietzsche declared “God is dead,”  much was debated on the human need to find meaning through their attempts at creating their identity in a fragmented world. In the movie, this complex process of self-fashioning, which is both dynamic and invisible, is captured deftly in one afternoon at a cabin. The focal point of the movie is John Oldman, a university professor who claims to be 14,000 years old and has stopped ageing after 35. He has met the Buddha, sailed with Christopher Columbus and been a dear friend of Van Gogh. Every decade or so, when people notice he doesn’t age, he packs and leaves to another place, under a new identity. Before leaving his current life as a history professor behind, he divulges his secret to his colleagues who are academics and scholars in different fields. This does two things. First, on being questioned why he chose to tell them his secret, he replies that “I wanted to say goodbye to you as me. Not what you thought I was.” This foregrounds the concept of the Self and how it may be different from the perceived Self. Second, once he chooses to do this, his Self is then dissected and pieced together through discussion amongst the colleagues who are experts in different fields of study, bringing in different perspectives to look at his Self. The construction of the Self is historically situated and is a conscious re-creation of what Nietzsche calls our “second nature” making us “poets of our lives.”  This process of re-creation has a variety of markers. When John Oldman reveals his identity as a Cro-Magnon, attempts are made to situate him in his historicity from multiple angles. The veracity of whether or not his claim is true becomes inconsequential, as the process of self-fashioning John Oldman as a Cro-Magnon becomes the truth. Categorically, his identity is located spatially and then ideologically, while his temporality is the playground where the process takes place. Can one construct and sustain a stable identity of Self? John begins with recalling his surroundings: the terrain, the weather, the animals. They try to locate him in his “home”, to stabilise his beginnings, but John cannot describe his home in accurate terms because it has altered extremely from past to present. His mind recalls infinitely vast natural landscapes but he can only see cityscapes around. He attempts to situate himself using modern geographical markers – “I suspect I saw the British Isles from what is now the French coast” – but the idea of home as it was no longer exists. Just like there is no one permanent sense of Self, there is no fixed idea of home, especially as time rolls by. John is then located in culture and language. He talks about the various languages he learnt and the fluidity in his identity as a Phoenician sailor, a Babylonian, a Belgian, a French, an American. His names changed but he always stuck to the sound “John”, even in his earliest identity. Will, the psychologist, remarks, “Yes, you (John) have grown and changed. But there is always innate nature. Wouldn't you be more comfortable squatting in the backyard?” Whether or not possessing an innate nature, one can infer that the Self tries to find an essential, stable core to understand itself. For John Oldman, it’s his first name, and maybe the security of a fireplace in his home whether he is a pig farmer or Jesus. He is also located in faith and philosophy. These ideological shapers of identity are fashioned at a sophisticated understanding of the Self and are intrinsically tied to temporality, as the certainty of death broadly frames them. Repeatedly, John is asked what religion he believes in and what he thinks of death. Such absolute concepts become fluid when stretched across thousands of years. His religiosity has flatlined and death has been hollowed out of its properties of loss and fear. A second in a mortal life would be a decade in John’s. His tensile human life allows many subtle elements in the creation of selfhood to be observed clearly, such as the role of the Other and of memory. The Self finds itself in a dichotomous relation with the Other. John took a long time to come to terms with his quasi-immortality and understand himself as different from everyone else. In that process the nature of difference also underwent multiple evolutions. From thinking something is wrong with everyone else to believing he is the one with an affliction. From being worshipped as God to being chased away as a demonic figure. The binary of Self and Other operates on identification by negation, that is, “I am what I am not” where neither the “I” nor the “I am not” are fixed. Memory is selective and retrospective. It is also tied to knowledge in that memories make sense in the present through the lens we acquire to see them from. John claims, “How can I have knowledgeable recall if I have no knowledge?” He learns to identify his memories with modern terminologies and concepts. Similarly, the Self is acknowledged through external terminologies and concepts that come into being as the human race and thought evolves. John becomes a Cro-Magnon only when anthropology establishes the term. John becomes Jesus only when the concept emerges and evolves through the centuries. John becomes a caveman only when cavemen are differentiated from a modern human. John becomes a liar only when his truth is falsified by everyone perceiving his Self. The process of the creation of selfhood is punctured by multiple Selves and multiple Others, constantly across space and time, fragmenting the continuity of Self. Being is what we take as stable, our own understanding of who we are. Becoming is an attempt to embody another Being. Currently, John is a professor of history, but through the narration of his past, he embodies multiple Becomings. He becomes a caveman. He becomes Jesus. Jesus becomes a caveman. Based on the above tabulation, some pertinent questions raise : Is John Oldman still Jesus in 2010 AD? Or has the idea of Jesus surpassed him. Was he ever Jesus in the way we understand Jesus? These loopholes emerge because the Self is not fixed, left unperturbed in a vacuum. It is often shaped in others’ minds. This is why John needs an audience to participate in his identity formation. The creation of selfhood is an ongoing process that involves both external and internal contribution. John’s choice to share his story and for it to then unfold and develop through the movie represents a microcosm of the process. In the dynamic world, a rigid sense of identity is fragile and is always being challenged. The character of Edith is a good example of what happens when the core belief on which you have built your identity –in her case, her religious faith in Jesus being a particular person in a particular setting – is challenged. That belief is so absolute for her that she breaks down hysterically on John’s story about the creation of Christ’s myth. There is no singular way of interpreting reality, which is why the same story exists in many different moulds. Similarly, the Self cannot be sustained in a fixed, singular identity. John Oldman can become a caveman, a liar and a nut all the same. Greenblatt, Stephen. Renaissance self-fashioning: from More to Shakespeare. University of Chicago Press, 2012. Self-fashioning refers to the process of identity creation undertaken according to set social markers or standards. Nietzsche, Friedrich. Thus Spake Zarathustra. Read Books Ltd, 2015. The difference between perceived self and actualised self can be understood as the former being how the world looks at you while the latter is the idea of yourself in the present compounded with what you are trying to become. Nietzsche, Friedrich. The Gay Science, § 125, pp. 181-182. Being is a stable understanding of Self but this stability is situated in a particular time and space. It is fixed in its context. 0 AD is the year of Jesus’ birth as a messiah. John is Jesus - even though, while John and Jesus were the same physical being, the myth of Jesus as God’s son was separated from John and took its own independent form over the following centuries. Nietzsche, Friedrich. “The Gay Science, translated by Walter Kaufmann.” New York: Vintage 374 (1974): 336. Bixby, Jerome. The Man from Earth. Directed by Richard Schenkman, performance by David Lee Smith, Falling Sky Entertainment, November 13, 2007. Snigdha Budhiraja finished her Master's degree in English Literature and is now doing a diploma in Liberal Arts – she's liberal enough to have disappeared into the paradox of tolerance. Interested in cultural studies. Likes starry skies, dead baby jokes and thinking.